Why use Flexible Packaging or Stand-Up Pouches? Packaging makes the world go round! Well, the world of food and consumer products, anyway. Think that’s an exaggeration? Imagine today’s grocery/retail store aisle without effective product packaging, Exactly. Products not packaged appropriately are not likely to do well and customer satisfaction will be largely nonexistent. Given the development of new packaging materials, manufacturers and distributors are presented with a seemingly endless variety of primary packaging choices: boxes, cartons, displays, bottles, composite cans and flexible packaging to name a few. With all of these options one stands out and is uniformly effective in protecting contents and convenient to the consumer, that is stand-up pouches! Stand up pouches, also known as ‘flexible packaging’ offers both the manufacturer and the consumer advantages over other conventional packaging choices. On the manufacturing side, flexible film can come on rolls in web form for full automation or can come pre-made for use in lower volume, semi-automated applications. Physically speaking, the benefits of the high gloss finish, the space savings when shipping and the zip-lok, recloseable feature are all reasons to gravitate to a stand up pouch for packaging your liquid or dry ingredients. From the filling end, the ease of changeover, the speed of automation and the film structures that increase product life are major advantages over boxes or printed poly bags. Flexible pouches protect contents from moisture, vapor, odor, pests, air and light. The barrier properties including foil and nylon keep contaminants out while sealing in such things as freshness, flavor and nutritional qualities. In addition, stand-up pouches are very convenient to use. These pouches, which have a bottom gusset save shelf space for consumers by storing conveniently in the garage, closet, kitchen cupboard or refrigerator/freezer. Optional tear notches make the bags very easy to open. Zip lock closures (for dry products) and pour spouts and re-sealable caps (for liquids) are available and are great features for recloseability or for use on larger bags where smaller portions are used. Regardless of product, the ability to market it effectively is critical to its success. Stand-up pouches stand vertically and neatly on a retail shelf which allows your brand’s products to stand apart from the competition. Wide front and back pouch panels are ideal for eye popping graphics to promote your brand. Custom printing which is glossy PET with photo quality graphics stands out and grabs the attention of the consumer. The type of printing on the PET outer layer is called “Rotogravure”, and this is the highest quality printing available. The custom printing on stand up pouches is trapped, meaning the printing is actually sandwiched between the PET layer and the adhesive layer insuring that no ink comes in contact with any food grade products or ingredients on the inside. In addition it protects the surface from being scratched, marred, or rubbed off. The inner layer can be white or clear if you want to view the product inside the stand-up pouch. Round Bottom Gusset – This style, the edge of the gusset is welded to the sides of the supporting walls, giving the package the extra strength and support it needs to stand up. K-Seal Gusset – This style, seals on both sides rise at 30-degree angles from the bag. This takes stress off the seals on either side of the package, and allows for additional volume. Pillow Bottom Gusset – This style of stand up pouch, the product housed in the package sits directly on the shelf. It is ideal for products weighing 5 pounds on up. This is not a very good solution as many manufactures cannot make this style. Stand-up pouches are an environmentally responsible packaging alternative. Made with less material, they ultimately generate less waste and most are recyclable. 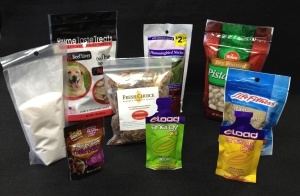 Not to mention Stand up pouches are FDA approved for food grade products, dry or liquid. Stand up pouches used with flexible packaging can easily be the solution to most packaging challenges.